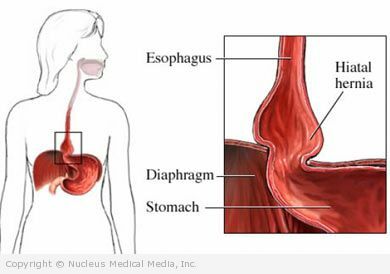 A hiatal hernia is a condition in which the upper part of the stomach moves up through a small opening in the diaphragm into the chest. The diaphragm is the muscular wall that separates the abdominal cavity from the chest cavity. Complicated hiatal hernia — Several other types of stomach herniation may be seen. These are uncommon but more serious and may require surgery. Many people are born with the hiatal hernia but the cause is still unknown. It may result from a weakening of the supportive tissues. Upper GI series — a series of x-rays of the upper digestive system taken after drinking a barium solution, to show the outline of the digestive system. For people who are obese, losing weight may relieve symptoms. Consume smaller meals 4-6 times a day versus three large meals. Avoid drinking large amounts of fluids with meals. Do not eat within 2-3 hours of bedtime. If you smoke, quit. Smoking weakens the lower esophageal sphincter, a muscle that controls the opening between the esophagus and the stomach. Wear clothes and belts that are loose around your waist. Avoid stooping or bending after meals, which puts increased pressure on the abdomen. Elevating the head of the bed on 6-inch blocks or sleeping on a specially designed wedge reduces heartburn. This position helps prevent stomach contents from refluxing backward into the esophagus. The hernia is at risk for twisting, which could cut off the blood supply to part of the stomach and cause that part to die. Seek medical care for prolonged or severe coughing or straining to pass stools or urine.